2,400 B.C. TO 1,500 B.C. The blade on this heavily patinated dagger is smaller than the handle and was probably resharpened at least one or more times. The handle is square in cross-section and also has "stitching" or zigzag flaking on both sides and edges. It measures 6 3/16 inches (15.6cm) long. Two phases are now recognized within the dagger making period. Phase A represents type I through type III daggers and phase B contains type IV and type V daggers. 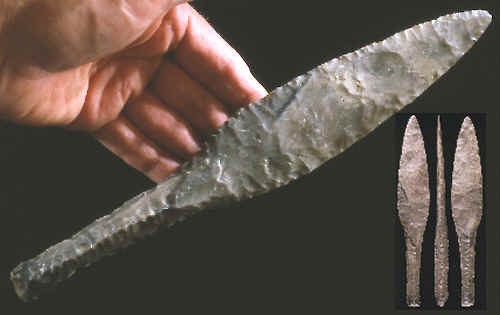 Type VI daggers appear around the end of the Neolithic period, around 1700 B.C. and continue to be made well into the Bronze Age. Type VI daggers have straight handles with no "stitching" and do not exhibit the great skill of flaking that the earlier styles are so well known for. This close-up area of flaking shows the "stitching" style of flaking on the handle of the dagger pictured above. This technique of flake removal was done with the use of a copper pressure flaking tool. The "stitching" or zigzag flaking on dagger handles was made with copper pressure flakers. Other tools that were used to make Danish daggers would include stone hammer-stones and either moose or elk antler and possibly copper billets (hammers). Hammer-stones and billets are stone tool making tools that are used during the initial stages of flake reduction by percussion flaking (striking off flakes) to shape the intended item. This is an excellent example of a type III dagger. The handle is square in cross-section and has "stitching" on both sides and edges of the handle. 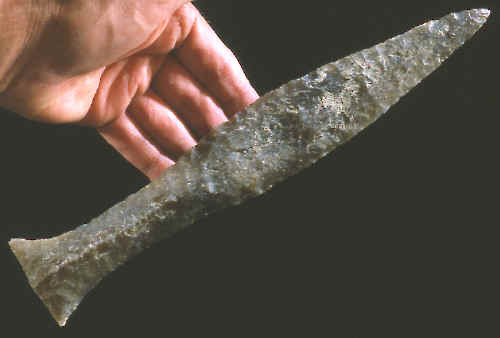 The original outer cortex, or surface, of the stone that this dagger was made from can be seen on the end of the handle. This dagger measures 8 3/16 inches (20.7cm) long. Dagger types and styles are not very good indicators of time. As might be expected there is no fine line separating one type from the next. Different types of daggers were being made at the same time as new styles were being invented and still others were fading out. Time dating for daggers can and has been identified in other ways such as C14 dating of organic materials found in association with daggers. This dagger is a good representative example for one of the styles within the type IV group of daggers. This one has a beautifully flaked handle that flares out on the end plus it has a very well done "stitching" style of flaking on both edges and one side. The blade shows evidence of grinding before a final series of even and uniform flakes were removed by pressure flaking. The cross-section of the handle is also very diagnostic for this type, which is a wide three sided triangle. This dagger measures 9 1/2 inches (24.1cm) long. Type IV Danish daggers begin the phase B dagger making period. The basic design change that defines them is the beginning of the "fishtail" or widening of the handle, very slightly in the beginning but with highly exaggerated examples coming later in the period. This close-up picture shows the edge flaking of the handle on the dagger illustrated above. This zigzag style of flaking is very carefully done by pressure flaking with a copper tool. 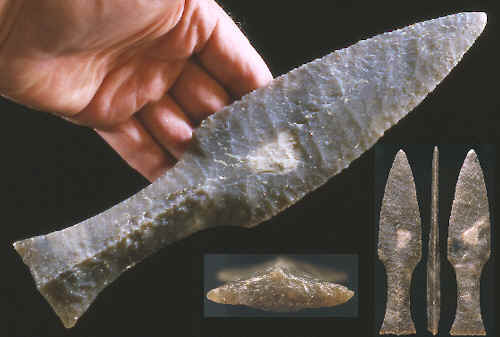 Type IV daggers began to be made sometime around 4,000 years ago. 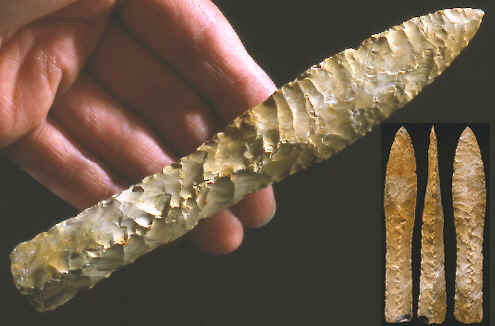 The majority of the daggers made during the dagger period were made between 4,300 to 3,800 years ago. This dagger is very similar to the one above except that the blade may have had little or no grinding prior to the last stage of flake removals. This dagger measures 10 3/4 inches (27.3cm) long. Danish daggers are thought to have been items of prestige. During the Late Neolithic period they begin to replace stone battleaxes that were commonly found in Middle Neolithic burials. Daggers are now found in stone-lined graves or cists along with individuals of importance. 1872, Sir John Lubbock, "Pre-Historic Times, Ancient Remains and the Manners & Customs of Modern Savages"
1952, "Danish Antiquities, II Late Stone Age", by P.V. Glob, pp. 122-123. 1996, "The Oxford Companion To Archaeology, Beakers" by Brian M. Fagan, pp. 88-90. 1998, "Chips, Vol. 10, #2, Thor's Toothpick, A Type IV-B Danish Dagger", by D.C, Waldorf, pp. 12-18. 2001, "Chips, Vol. 13, #2, Type V-A Dagger", by D.C. Waldorf, pp.10-17. Personal communications with Dave Waldorf.